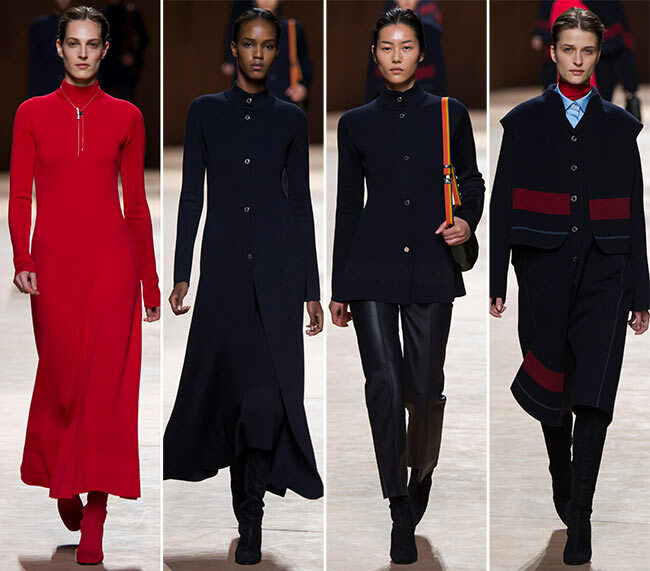 Red and navy took over the Hermes fall/winter 2015-2016 collection presentation on the Paris Fashion Week runway. 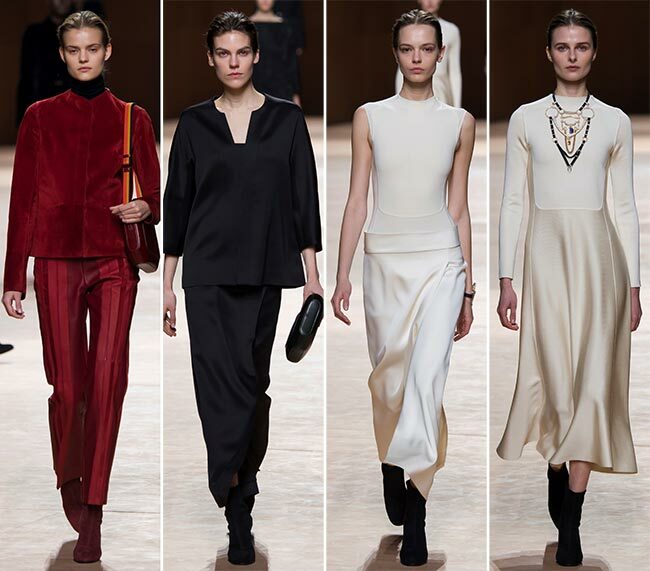 White and black fell into the same collection, while small bursts of orange and creamy satin also wheedled their way in. Among all the darker hues or the stark contrasts, there was a sudden burst of sunshine as well with a lovely bright yellow ensemble, with the hem of the tunic falling to the tops of the thighs and the skirts heading down to below the knee before having the rest of the leg clad in a navy colored velvet pair of boots. Such simplicity, that when placed smack around the center of the collection looks positively divine among the less colorful variations. 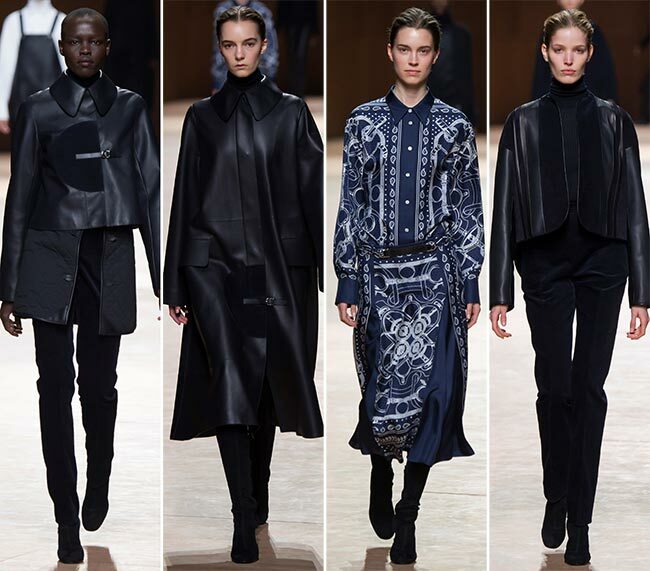 This was Nad‚Äö√†√∂¬¨√Üge Vanhee-Cybulski’s debut line for the house as its new creative director, Hermes being a French fashion house established back in 1837 by Thierry Hermes in Paris, today specializing in leather, lifestyle accessories, perfumes, luxury goods and ready to wear fashions. Today, Hermes offers us ladies everything from scarves and ties to watches and stationary, gloves and footwear to tableware and jewelry. It is an interesting company with much to offer the average female as well as the male, while we love the cashmere and silk blends it produces. 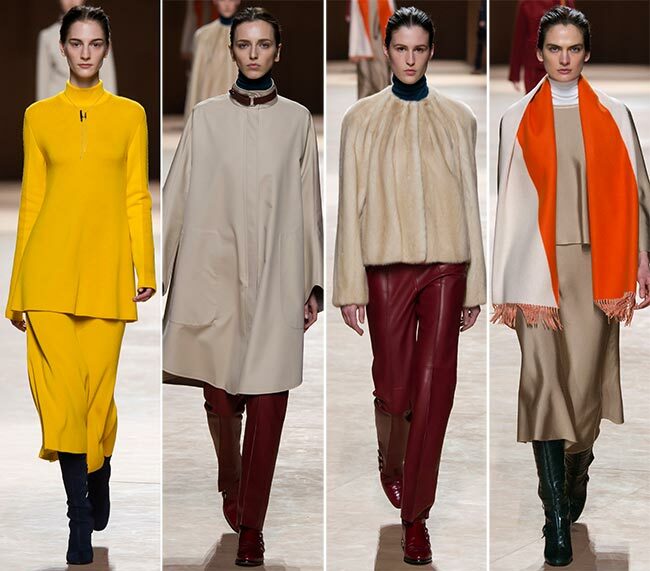 Hermes scarves are famous and one does appear on the runway this time around as well. Those lovely things have been utilized by royalty as well, from appearing on the 1956 British postage stamp featuring Queen Elizabeth II to being used as a sling by Princess Grace, they have literally appeared everywhere. It is, without a doubt, a brand to be reckoned with, even if it is not as popular as some of the other Parisian fashion houses. 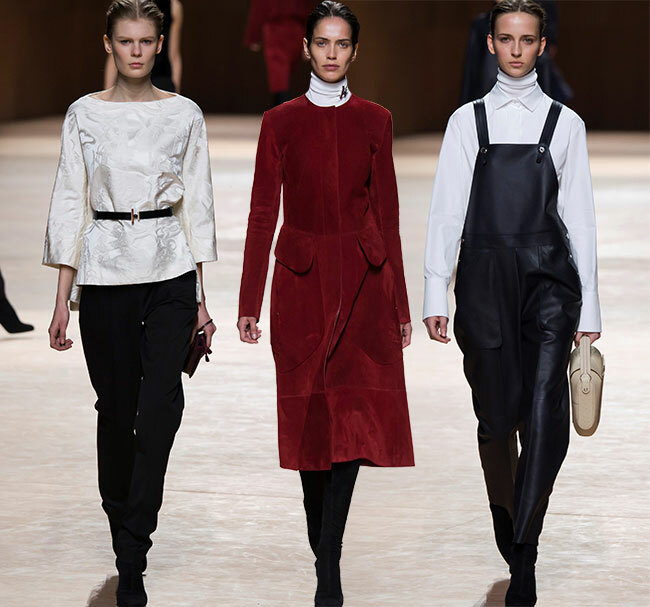 Leather is a common material used by Hermes and that might be why the latest Hermes fall/winter 2015-2016 collection features so much of it, from jackets to overalls, knee length coats to straight cut pants. 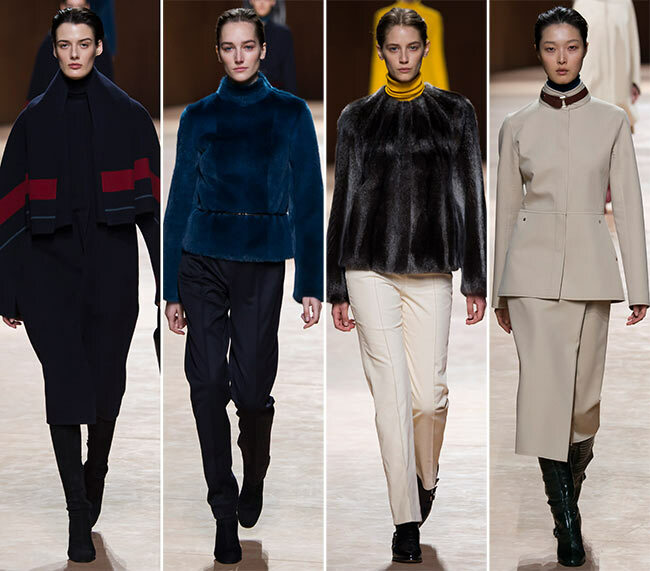 It appears in navy most of the time, while scarlet pants, boots and jackets also rock the fabric. We particularly love seeing the velvet in this collection, as it is one of those olden materials that have crept back into the biggest trends list for the year, particularly the cooler season of fall and winter. We do love seeing the ivory pieces as well, from the silky long sleeves midi dress that appears to be closer to a maxi to the sleeveless high neck top tucked into a lovely wraparound style skirt falling to the ankles. 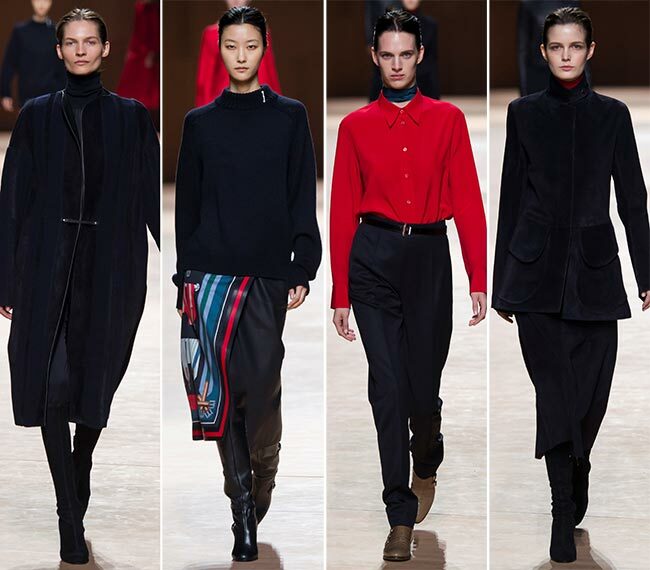 From coatdresses to sleeveless tops, boots and perfectly cut pants, the velvet appears in darker blue hues, in black and in scarlet red. 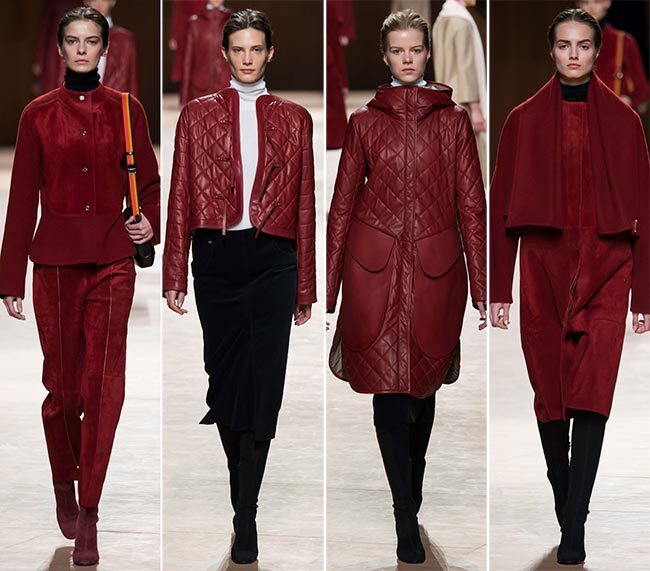 The looks are quite lovely and the use of color and texture combinations rather genius. Then again, this is Hermes we are talking about. They have the right amount of experience required to churn out only the best in fabrics and outfits, perfectly fit for the modern woman, who adores style and comfort in equal tidings.